The SCT project in South Sudan came to an end on the 20th July 2017, with a large community event in the Bentiu refugee camp. – Organizing a community final event with the groups involved in TSC activities. “Bringing the circus magic to a community who do not even know the concept of it was a moving experience: we got a rope into a tree branch and, after showing some circus tricks, we invited young people to try on our watch. Many climbed without fear, being surprised by the marvelous circus language, that they have never seen before“. 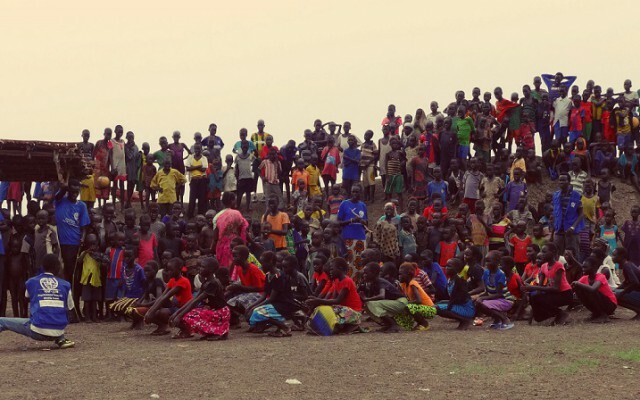 The final event involved the community in a long parade through the Bentiu refugee camp, with several stops in which traditional dances, songs and African music were performed. These were prepared by art groups led by the participants in the TSC workshops. The parade attracted and involved a large number of people, about 1000. “At the point of arrival, we made our counter-gift to the community that had so generously offered their performances: we started to juggling with fire and we attached the aerial to the tree to make the circus alive for the last time in the streets of the Bentiu camp. It was wonderful. In the end, there was nothing left to say than “thank you” and “goodbye”. This experience has given us and taken from us so much, in terms of energy and enthusiasm, that we will never forget it“.